You'd never guess it to look at them, but the two buildings that face each other (obliquely) across Vienna's Michaelerplatz were erected within 20 years of each other. 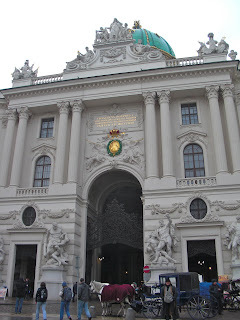 A late addition to the rest of the Hofburg palace, the Baroque-style entrance is an extravagant concoction of Imperial Austria, which at the end of the 19th century was as archaic as the Baroque, although it didn't know it. 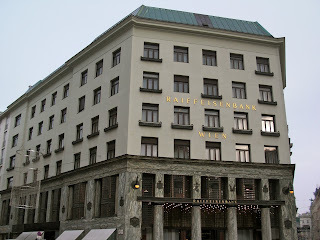 The antidote to all that ornament and artifice is found across the street, in the building that now houses the Raiffeisenbank. Created by Adolf Loos in 1910 as the Goldman & Salatsch Building, it's known colloquially as the Looshaus. Naturally, the Viennese were scandalized by Loos' affront to not just the palace's Baroque tradition but also to the floridity of the Secession movement. What's striking today is how the Hofburg looks almost preposterous, an expensive puffery, yet the Looshaus is still a really nice building. Its aspirations were considerably more modest, of course, but it remains clean and functional, capturing the eye with its elegant yet assertive proportions and high-quality materials. I think Loos would declare himself the victor in the Viennese architecture wars, and so would I. We'd both have to admit, however, that the old Imperial buildings are still the big draw for most visitors. And why not? It's fun to be amazed.